It’s almost time for spring turkey hunting in Vermont. Youth spring turkey hunting weekend is April 27 and 28 this year, and the regular spring turkey season is May 1-31. Landowner permission is required to hunt on private land during youth turkey hunting weekend. To participate, a youth must be age 15 or under and must have completed a hunter education course and possess a hunting license, a turkey hunting license and a free youth turkey hunting tag. All of these are available on Fish & Wildlife’s website (www.vtfishandwildlife.com) or from any license agent. The youth must be accompanied by an unarmed licensed adult over 18 years of age. Shooting hours for the youth weekend are one half hour before sunrise to 5 p.m. 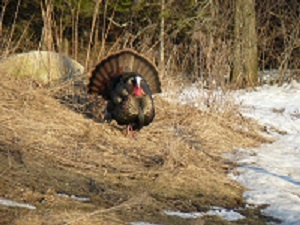 The youth may take one bearded turkey during youth weekend and two bearded turkeys in the regular May hunting season. Last year, young hunters took 525 turkeys during the two-day youth hunt with a success rate of 27 percent. The regular spring turkey hunting season is May 1-31. Shooting hours are one half hour before sunrise to 12:00 Noon, and two bearded turkeys may be taken. A shotgun or archery equipment may be used in the youth or regular spring turkey hunting seasons. Shot size must be no larger than #2 and no smaller than #8. Spring turkey hunters experienced a 23 percent success rate overall last year, and of those successful hunters, 40 percent harvested a second bird.